That's how many calories I consumed tonight at dinner. Oh! And let's not forget fat grams. That number would be a fat, round 100. Fat. Round. Hmmm. Interesting choice of words. Oh! And I started the day with a Cinnamon Melt from McDonald's -- my first. Have you had those? My word. Gooey, sweet, warm, cinnamony -- and only 460 calories and 19 grams of fat. Excuse me. I think I need to go lay down. Oh dear - I had a brownie & mint mixer at Culver's two weeks ago...we're talking 832 calories according to that chart. But it was sure tasty! I suddenly feel better about the chick-fil-a sandwich I had along with a chocolate shake. Oh, and the half of my husbands sandwich I snarfed, too. Culver's! Yay! (you don't know me, but I'm one of Angie's friends and I came by to check out your new design, lovely by the way). My grandparents life in Wisconsin and the Culver's in town is often our daily treat. Concrete custard malts, hurrah. Thankfully, I don't visit there often or I'd have to roll myself back to the West coast (but I am heading there next weekend... Culver's is definitely on the list). You are a gal after my own heart! Culver's is one of my favorites. But, can you believe I've never tried the custard. It sounds like I must remedy that very soon. Never had a Culver's. Our treat around here is the Coffee Caramel Handspun Milkshake from Chick-Fil-A. That is until someone told me the other day that one of those babies has 780 calories. Ouch. And I'm on day 11 of Phase 1 South Beach. Lemme go eat some more eggs. I love the custard too! Did you have some for me too? If so, that helps your calorie count! Culver's must be a northern thang. Never heard of it. I LOVE bacon burgers. Heart attack on a plate. Never heard of Culvers. We don't have them around here and it's probably a good thing. I'm sure this would be a treat I would enjoy! I'm so glad we don't have a Culver's. You do a mighty fine commercial. I've seen your name so many times, just thought I'd drop by. 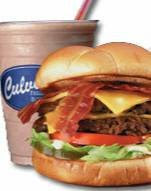 The first time I saw a Culver's (which was recently) I called my husband and said "What the heck is a frozen custard butter burger?" That sign still cracks me up every time I pass it!! Oh my gosh, that burger looks SO GOOD. You have Culver's? Color me jealous! We only have measly old Chick-fil-A. Lucky. And no, I haven't had a McD's Cinnamon melt. But we have yet to eat breakfast today (hello, it's 9:48 here) and that is a great option. How in the world do you take a bite out of a burger so big? Looks delicious!